Brilliant gold color. Woody aromas of vanilla extract, butterscotch, spice cabinet, and milk and honey with an oily, soft, dryish medium body and a tingling, breezy vanilla cream, shy botanical, and sweet tea finish. An easy-going barrel-aged gin for non-gin drinkers. Bottom Line: An easy-going barrel-aged gin for non-gin drinkers. 92 • Cutwater Fugu Vodka Soda Cucumber 7% (USA) $14.99. 85 • Cutwater Fugu Vodka Soda Grapefruit RTD 7% (USA) $14.99. 92 • Cutwater Fugu Vodka Soda Lime RTD 7% (USA) $14.99. 85 • Cutwater Tequila Paloma RTD 7% (USA) $14.99. 94 • Cutwater Tequila Lime Margarita RTD 12.5% (USA) $14.99. 85 • Cutwater Black Skimmer Bourbon Lemon Tea RTD 7% (USA) $14.99. 88 • Cutwater Black Skimmer Bourbon Highball RTD 10% (USA) $14.99. 87 • Cutwater Fugu Vodka Mule RTD 7% (USA) $14.99. 93 • Cutwater Fugu Mild Bloody Mary RTD 10% (USA) $14.99. 84 • Cutwater Ginger Beer Cocktail Mixer 0% (USA) $5.99. 94 • Cutwater Tonic Water Cocktail Mixer 0% (USA) $5.99. 92 • Cutwater Fugu Vodka Horchata Cold Brew RTD Cocktail 12.5% (USA) $15.99. 93 • Cutwater Spirits Fugu Vodka 40% (USA) $21.99. 87 • Cutwater Spirits Fugu Horchata Vodka 40% (USA) $20.99. 86 • Cutwater Spirits Fugu Habanero Vodka 40% (USA) $20.99. 84 • Cutwater Spirits Old Grove Gin 44% (USA) $26.99. 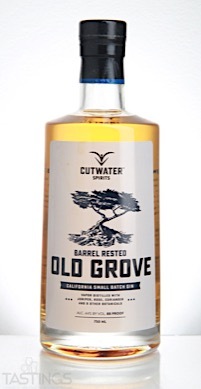 84 • Cutwater Spirits Barrel Rested Old Grove Gin 44% (USA) $29.99. 88 • Cutwater Spirits Spicy Bloody Mary Mix 0% (USA) $6.99. 84 • Cutwater Spirits Mild Bloody Mary Mix 0% (USA) $6.99. 89 • Cutwater Spirits Mai Tai Mix 0% (USA) $6.99. 84 • Cutwater Spirits Three Sheets Rum and Ginger Ready-To-Drink Cocktail 7% (USA) $14.99. 83 • Cutwater Spirits Three Sheets Rum and Cola Ready-To-Drink Cocktail 7% (USA) $14.99. 90 • Cutwater Spirits Old Grove Gin and Tonic Ready-To-Drink Cocktail 6.2% (USA) $14.99. 86 • Devil’s Share Single Malt Whiskey 46% (USA) $129.99. 87 • Devil’s Share Bourbon Whiskey 46% (USA) $129.99. 93 • Devil’s Share Moonshine Whiskey 49.3% (USA) $27.99. 88 • Three Sheets Rum 40% (USA) $26.99. 86 • Three Sheets 2 Year Old Barrel Aged Rum 40% (USA) $39.99. 84 • Three Sheets Spiced Rum 40% (USA) $29.99. Barrel-aged gin has become a trendy spirit produced by numerous artisan distillers in America. Actually they are bringing this tradition back as barrel-aged gin has been made on the Spanish island of Menorca for more than two hundred years, with white oak barrels being the preferred vessel. The current barrel-aged gins made in America have a brown color, derived from the bourbon barrels in which it is matured. This technique gives these gins aromas of vanilla and caramel. These gins are served either over ice or serve as the base of cocktails such as an Old Fashioned or Manhattan. Cutwater Spirits Barrel Rested Old Grove Gin rating was calculated by tastings.com to be 84 points out of 100 on 4/25/2017. Please note that MSRP may have changed since the date of our review.